An artist’s rendering of the crane being brought in to work on the wheelchair-accessible pedestrian bridge over Sukhumvit. Part of Sukhumvit Road and the Central Road bypass tunnel will be closed intermittently from Sept. 2-6 to allow for construction of a wheelchair-accessible pedestrian bridge. 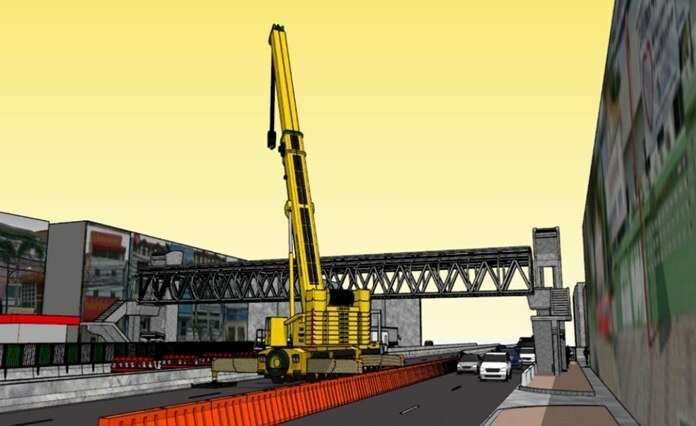 The long-delayed project will hit a major milestone next month when a 400-ton crane truck anchored on the traffic island lifts the 80-ton, 43-meter-long prefabricated superstructure onto supports on each side of the busy highway by the Redemptorist School for Persons with Disabilities. The bridge, equipped with elevators on each side, is expected to open at year-end. Engineers also will use the period to remove the old bridge in front of Pattaya School No. 5. From Sept. 2-6, the southbound side of the Central Road bypass tunnel will be closed from 7 p.m., although the surface-level parallel road will remain open. On Sept. 3 only, northbound tunnel traffic will be closed from 8 a.m. until 4 p.m., with the surface road remaining open. On Sept. 6, all of Sukhumvit – both sides of the tunnel and the surface roads – will be closed at 8 p.m. and 10 p.m., respectively, until midnight. Coming off Highway 7, no left toward central Pattaya will be allowed, although motorists can turn right to North Road or make a U-turn and travel via the railway-parallel road toward Sattahip. Northbound, Sukhumvit will be closed at the Index Living Mall with turns on to Soi Siam Country Club will be allowed. For more details, questions or updates, call the Pattaya Call Center at 1337.